Rejoice icicle lovers. Dr. Freeze has delivered his magnum opus. For the record, Stephen Morris, a professor of physics at the University of Toronto, does not call himself Dr. Freeze. But by his own admission, he is obsessed with icicles. He has observed them in the environment and grown them in his lab. He has accumulated thousands of photos and hundreds of videos of icicles forming under different conditions. An icicle begins when a dangling water droplet starts to freeze. The part that freezes first is near the foot of the droplet and it forms a hollow tube that continues to grow vertically downward. Icicles grow faster at the tip than on the sides, which gives them their familiar carrot shape. The rate of growth is a function of water flow and temperature. Experiments conducted at the University of Toronto reveal that icicle ripples are caused by impurities in the water. Even water that is much purer than tap water will form rippled icicles, but icicles created with distilled water are smooth. Regardless of temperature or water flow, the ripples are always about one centimetre apart. Some of the controlled experiments documented in the Icicle Atlas database produced icicles that are particularly “leggy,” meaning they sprout side branches that start to form their own vertical columns. The physics behind these branching icicles are not yet well understood, but it appears that when a branch first begins, it diverges from the main icicle body at a 60-degree angle, reflecting the hexagonal symmetry of ice crystals – the same symmetry seen in snowflakes. Icicles can stop growing if water flow decreases or stops entirely as the air temperatures drops. The end of growth is know as cessation. Most icicles seen on a cold winter day are no longer growing, but are simply relics left over from a period when conditions were favourable for icicle formation. Icicles can shrink by sublimation, losing mass directly to the air. And he has tried – and is still trying – to puzzle out the underlying theory that rules their cold and pointy essence. And now he’s giving all of it away. He calls it the Icicle Atlas. It’s an online database that includes nearly all of his icicle research to date, and it’s free for anyone to use without restriction, be they scientists, artists or Christmas-card designers. It’s an uncommonly large amount of scientific data to make public – the equivalent of more than 200 DVDs worth – all dedicated to icicles. There’s never been anything like it. And in an era when physicists typically win Nobel prizes for studying unseen particles and phenomena that lie far beyond the reach of human senses, it’s just a little bit rebellious. “I’m interested in patterns in nature in general,” says Prof. Morris, whose area of expertise is officially called experimental nonlinear physics, but which might just as easily be described as the science of everyday experience. And when Prof. Morris walks around the campus and the streets of the Toronto neighbourhood where he lives, icicles are what he sees in front of him. The first thing to appreciate about icicles is that while they are a natural phenomenon, they are not easily found in nature. Take a winter walk in the woods and you’ll find ice and snow everywhere, but few icicles. Travel across the solar system and you will detect frozen water in virtually every nook and cranny, from the fractured skating-rink-surface of Jupiter’s moon Europa to the depths of permanently shadowed craters on sun-baked Mercury. But no icicles. Only here on Earth – and, for the most part, only in northern cities – are icicles a relatively common feature. This is because icicles require two things: an atmosphere that enables the existence of water, and the right conditions where that water is dripping, and can be coaxed to transfer enough heat into the air to freeze. In purely natural settings, such circumstances only arise where water is near the freezing point and in vertical motion, such as around waterfalls, or seeping along cliff faces that can form frozen cascades. But such places are rare. It was the arrival of the urban landscape that made our world icicle friendly. A typical 19th-century Canadian city is essentially a giant machine for generating icicles. If it’s dripping water you need, you just can’t beat those overhanging eaves and poorly insulated rooftops. This accounts for why there are so many icicles to be found in the older parts of Ottawa, Montreal and Toronto, among other places. And because he lives in a part of the world that is optimized for icicle production, it seems inevitable that icicles would eventually come to Prof. Morris’s attention. Icicles are inherently interesting to physicists, because unlike the orbit of the moon or the structure of an atom, there is no physical theory that reliably predicts their precise shapes and characteristics given a particular set of initial conditions. And the problem is not just an academic one. Icicles belong to a larger set of phenomena that are equally challenging to predict and mitigate, from the growth of hailstones to the buildup of ice on airplane wings, power lines and bridges. In short, icicles offer “a well-defined, compact scientific problem, with practical applications,” says Lasse Makkonen, a principal scientist at the VTT Technical Research Centre of Finland in Espoo. Dr. Makkonen is among the handful of scientists to have delved into the details of icicle structure and behaviour. Starting in the 1980s, he developed a mathematical description of icicle growth that helps account for why icicles are long and pointy. While common sense dictates that water should be freezing at an equal rate on all parts of an icicle, it’s clear the tip grows faster than the sides – as much as 20 times faster, Dr. Makkonen says. This is because the tip of an icicle forms a hollow tube that grows into the dangling water droplet where it narrows. As the droplet periodically falls, it carries heat away and exposes the tip to the air. The air then steals more heat and promotes further ice growth. Dr. Makkonen recalls reaching the conclusion on paper that icicles must have hollow tips and then going out to test it in the real world one day. Later, Raymond Goldstein and colleagues at the University of Cambridge in Britain proposed a theory for the shape of a dripping icicle – or rather, the Platonic ideal of an icicle. While the theory reproduced the long pointy shape, there were features it could not reproduce, including ripples. All icicles found in “the wild” have rippled surfaces, with the distance between each wavy ripple averaging about a centimetre or so. This number is remarkably consistent, regardless of temperature and flow rate. Icicle ripples have been studied by Japanese researchers at the Institute of Low Temperature Science at Hokkaido. In a 2002 publication, they posited that ripples form because of a “surface instability” in the water flowing down an icicle – a slight deviation that tends to grow over time. But as to why this instability exists, the Japanese researchers could not say. It was at that point, starting in 2008, that Prof. Morris took hold of the icicle mystery – or perhaps vice versa. The key to the physics of icicles can only be discovered with data, Prof. Morris decided, and plenty of it. But waiting around for icicles to form outdoors is neither a convenient nor a suitable approach for a controlled study. Working with a graduate student, Antony Szu-Han Chen, Prof. Morris set about building an icicle machine in his lab. On the outside, the machine looks like a Styrofoam-clad box with a narrow window for a camera to capture images of what lies within. There, refrigerated walls enclose a cooled space about one metre tall with a rotating wooden dowel at the top on which chilled water is slowly dripped and where icicles can grow. The rotation equalizes the effects of air currents in the box and allows the camera to capture all sides of an icicle as it develops. Plenty of other modifications have evolved to make sure the machine can grow icicles reliably. “Everyone says it looks like a science fair project, but it’s deceptively complicated,” he says. The machine allowed Prof. Morris and Mr. Chen to do what no one had done before in a systematic way: grow icicles, over and over, under a wide range of conditions. They took lots and lots of pictures. Eventually, they discovered something no one had realized before: Icicle ripples are caused by impurities, such as salts, in the water. When distilled water is used in the icicle machine, the ripples go away and the icicles end up looking a lot more like Dr. Goldstein’s Platonic ideal. Add just a minuscule amount of salt, about two parts in 100,000 – which is less than the total impurity of regular tap water – and the ripples come back. Prof. Morris has also used the machine to grow icicles that are are decidedly un-Platonic, with squat shapes, extensive ripples and multiple branches or “legs.” All of these examples can be found in the Icicle Atlas, forming a repository of well-measured ice shapes. But the larger goal has yet to be reached: a set of a mathematical equations that correctly anticipates the full range of icicle forms and the circumstances under which they will appear. Prof. Morris’s findings have attracted attention beyond the research community. 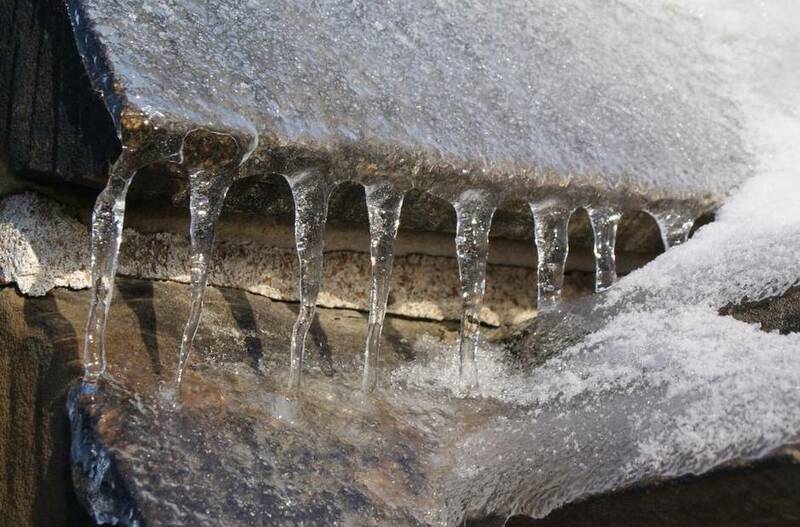 People around the world have sent him photos of icicles in different states of growth. An entrepreneur once approached him about how to make flavoured icicles that could be grown in a shop. (It’s harder than it sounds and not very tasty.) Later this spring, Toronto music ensemble Continuum will perform a piece that was partly inspired by Prof. Morris’s icicles. It is this aesthetic appeal of icicles that has compelled him to make his data public without restriction, “I hope to be surprised with what people do with it,” he says. For some, the answer will simply lie in browsing the digital pages of the Atlas and watching videos of icicles growing in Prof. Morris’s machine. They are mesmerizing. They also remind us that there is another point to icicles – apart from the obvious one. As the byproducts of our squandered heat, they are evidence of our persistence and even our prosperity in the face of a cold and unforgiving season. It’s a form of spontaneous beauty that happens because we happen to be here to witness it. Consider the icicle, Stephen Morris says, and rejoice.